ROCK SPRINGS WYOMING Vending Machine Companies! 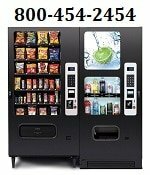 Offering Free Vending Machine types: Snack, Soda, Coffee, Deli, Drinks, Food, Frozen, Healthy vending machines, Micro Markets, Amusement Games and repair services for your employee breakrooms! Please contact these vending machine operators directly for more information about their vending services. Amusement CO Vending – Vending and amusement machine services, Rock Springs, Wyoming. Jenkins Music & Vending – Juke Boxes, Pool Tables, Dart Machines, Vending. Company based out of Rock Springs, Wyoming. Western Wyoming Vending – Full Line Vending Machine Equipment. Serving Green River, Jackson, Evanston, Kemmerer, Rock Springs, Wy areas.